The Drug Technical Advisory Board (DTAB) in India recently recommended to the Union Health Ministry that a provision be introduced in the Drugs and Cosmetics Rules to ban the import of cosmetics tested on animals. India had already committed to phase out animal tests for locally-made cosmetics; the Health Ministry is in the process of putting in place the final framework. Chinese regulators had demanded that cosmetic products be animal-tested to ensure safety, even when this had previously been determined without animals, leading to several “cruelty free” companies, which sold their products in China, being criticised for breaking their cruelty-free pledges. However, the Chinese Food and Drug Administration has announced that animal tests for some cosmetics products manufactured in China will no longer be compulsory. It is hoped that this requirement will, in time, extend to imported products. 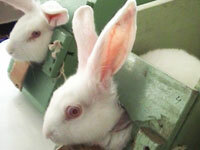 Donate now and help the NAVS campaign against animal experiments.